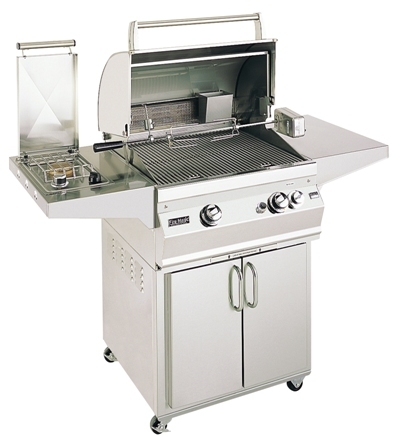 Exclusive Features of The Custom II: This grill offers a true 24" across the cooking surface, not the FRAME of the grill like others measure. A total powerful BTU rating of 64,000 on the main cooking surface and a full-length backburner rated at 18,000 BTU's. The total cooking area is approximately 528 sq. inches so you can cook for the family or a party! The stainless steel ccart features dual storage doors below, inside shelf, condiment holders, a stainless steel prep shelf on one end, tank access (propane models) and heavy-duty cart casters for ease of portability. This unit also includes a side burner on the left side. The Custom II ALSO includes a heavy duty rotisserie kit with stainless steel motor capable of turning 20 lb pieces of meat with ease! There is also a smoker box for wood chips. Of course, with a rotisserie you also need a backburner and this unit features a full 18,000 BTU's.